Video: Can Prenatal Vitamins Help You Get Pregnant? Home → Egg Health → Video: Can Prenatal Vitamins Help You Get Pregnant? Have you wondered if you need to take a multivitamin as a part of your natural fertility program? It is in general a good idea across the board for most men and women preparing for conception. A study from Harvard Medical school involving 18,000 women has shown that taking multivitamins, particularly folic acid, can improve chances of pregnancy. Think of this supplement as insurance for the body! This video was shared live. Download the Instagram App to watch our live broadcasts! A multivitamin or prenatal is not supposed to replace clean, whole foods in your diet from which it is most important to get nutrients. It is not a standalone product for fertility, but it can help because we know nutritional deficiencies can have an impact on ovulation and implantation, as well as chances of miscarriage. Do you skip any meal(s) each day, or every couple of days? Are you stressed regularly or overworked? Do you eat at least two servings of vegetables and fruits a day? Are you eating enough dark green leafy vegetables? Is your period anything outside of being “normal”? If you answered yes to any of these questions, then it may be time to invest in a quality whole food multivitamin! Look for a whole food multivitamin. A whole food multivitamin is going to be recognized by the body better, as if it were a food. Vitamin D: a very popular supplement and actually a hormone that may are deficient in, particularly in the United States. Vitamin E: a nutrient very important for egg health, ovulation, and sperm health. Vitamin C: an important nutrient for sperm health, quality and DNA of the sperm, and may decrease chances of miscarriage and chromosomal issues because of the health of the sperm. Vitamin C can increase hormonal levels and help women with luteal phase defect as well. Vitamin B6 and B12: Both of these B vitamins have been shown to help with luteal phase defect and reduce the chance of recurrent miscarriages. Folic Acid/Folate: a nutrient known to be instrumental in healthy neural tube and spinal cord formation in a fetus. It may also reduce homocysteine levels in the blood, connected to recurrent miscarriage, as well as with heart disease. Iron: Studies have shown that when iron levels are not sufficient (anemia), there are decreased chances of ovulation. Selenium: a vitamin that protects eggs and sperm from free radicals, and it very important for healthy sperm creation. Zinc: a nutrient that is very important for the creation of sperm, that also helps with hormonal balance and preventing early miscarriage. 1. FertilicaTM Fertile Woman One Daily – Whole Food Multivitamin: This is a whole food multivitamin formulated specifically for the needs of women in their reproductive years, made completely from whole foods and is organic, providing the body with the highest absorption, utilization, and bioavailability. 2. Baby and Me Prenatal Multivitamin: Made by MegaFood, Baby and Me can be used while trying to conceive, however is a 100 % whole food prenatal made for use in pregnancy that also contains certified organic herbs. A multivitamin/prenatal is a great part of a complete natural fertility program, but we would not rely on it alone. 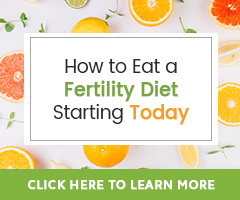 It will be helpful especially if you are transitioning to a healthier diet, but do try to get the nutrients from a healthy whole food Fertility Diet first and then a multivitamin or other nutritional supplement as insurance.